Role and responsibilities of the building practitioner in Complex Home Modification Assessment for NDIS participants. Professional advice on the design, scope, viability and cost of proposed home modifications is key to decision-making by the National Disability Insurance Scheme (NDIS) when approving complex home modifications. This presentation looks at key areas of the of NDIS Complex (Structural) Home Modification Assessment Report which rely on the advice of the Building Construction Professional, the knowledge and experience needed by practitioners who are engaged to provide advice and sign off Part 6 of the Report, and the importance of good advice in ensuring that home modifications meet the needs of participants and the requirements of the NDIS. 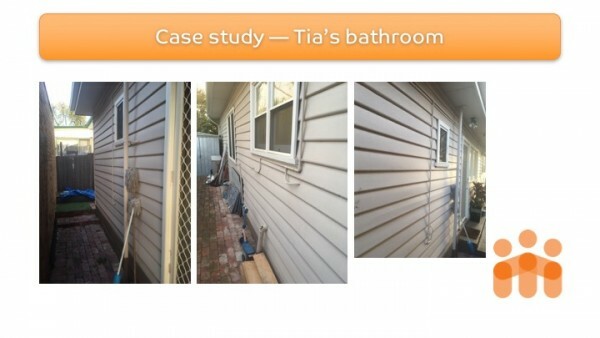 Home Modification Victoria has developed a Building Construction Professional Report for use by professionals signing off on Part 6 of the NDIS Complex (Structural) Home Modification Assessment Report, and an overview of this report and is provided in this presentation. The NDIS Complex (Structural) Home Modification Assessment Template must be used by the Assessing occupational therapist (OT) for all complex home modification assessments and recommendations. The assessment of a complex home modification may only be undertaken by an OT who meets the National Disability Insurance Agency (NDIA) criteria for Complex Home Modification Assessment. Professional qualifications and registration to meet the Guide to Suitability requirements for registration with the NDIA as an Occupational Therapist. A good understanding of the scope and purpose of the NDIS, particularly as it relates to the goals and use of supports in a participant’s plan to enable them to lead an ordinary life. NDIS Registered Providers who successfully completed NDIA authorised ­­­­­­training in, and were selected through an Expression of Interest process for CHM assessment during the trial phase of the NDIS prior to 30 June 2016. Source: NDIS FAQs about Home Modifications. 24 February 2017. The building professional must meet the requirements for registration or certification in the State or Territory in which they are providing advice and in which the home modification is being proposed. and to be the most suitable of all reasonable alternatives. the scoping of work in relation to the proposed design – this is extremely important as it forms the basis of our cost estimation which informs funding allocation from the NDIS to deliver the project. 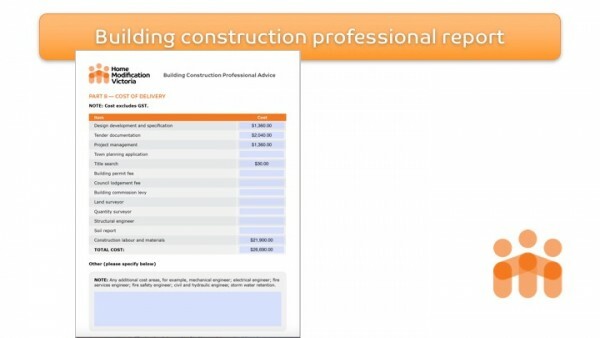 cost estimation of reasonable and necessary home modification, which covers the full cost of project delivery including design specification of a suitable standard for certification and construction, planning and certification fees, specialist consultants such as engineers, project management, fittings, fixtures and labour. Part 3C of the Assessment Report requires a statement from the building construction professional in relation to the viability of the home modification and its likely cost. ­—Part 3C: Information about the property. Footnote 3. Part 5A of the Assessment Report requires the review of detailed concept drawings and quotes for project delivery. Their requirement for the quality of the drawing is very high. 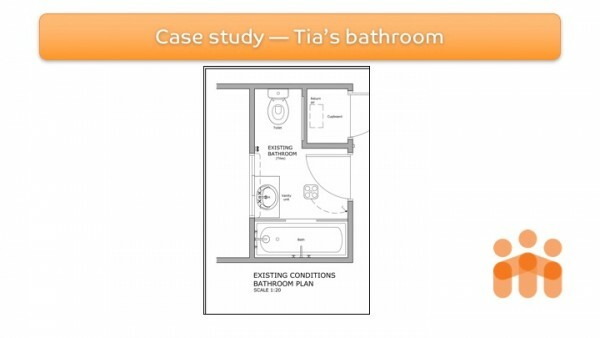 Drawings for this report should: be draft working standard and clearly legible; be drawn to scale, labelled and dimensioned as appropriate; show location of fittings, fixtures and services; show that door swings and required circulation spaces for AT use have been considered… If the modification is approved construction quality drawings can then be commissioned by the participant and funded at NDIS rate. Source: NDIS complex structural home modification assessment template­—Part 5A Recommendations: Preferred options. The quality of the design concept drawing needs to be relatively high because they form the basis of the cost estimate and builders’ quotes which are provided in the report and recommendations, and are a key informant of the for NDIS of the level of funding provided for the proposed modification once approved. While it is not standard practice in the design and construction industry to require builders to quote at the concept stage of a project, it is required for NDIS projects. Therefore, close attention must be given to the suitability of proposed design, the scope of the work, identification of compliance requirements, structural issues and any risks involved with project delivery, in order to ensure that the concept drawing has sufficient detail for the provision of an accurate quote as a basis for funding decisions. When the project is approved, the concept drawing is the key reference for the design practitioner who will prepare the design plans and specifications required for building certification in compliance with the building code and standards, and which become part of the building contract to guide construction work. As noted in the NDIS Operational Guidelines, “there are a number of laws and regulatory frameworks, for example Building Codes and Australian Standards which regulate home modifications. The NDIA is unable to fund home modifications which, if provided, would be contrary to a law of the Commonwealth, state or territory…” Source: NDIS Operational Guidelines 5. Home modifications. Home Modification Victoria has identified some of the relevant laws and standards that may be triggered by providing, for example, a bathroom modification. Considering this rather long list as a starting point, a building construction professional must accept the high level of risk and responsibly is signing off Part 6 of the Assessment Report. The sign-off by the building construction practitioner provides the NDIA with assurance that their liability has been met in relation to ensuring that the proposed home modification meets client needs, compliance requirements, and the NDIA criteria. As pleased as Home Modification Victoria is with the formalisation of the role of the building construction professional in the NDIS complex home modification assessment process, we are also very conscious of the professional liability and the weight of responsibility that rests on our design and building construction professional advice. We must make this process work in a practical and sensitive way ‘at the coalface’ providing a service in people’s homes. And we must ensure that we deliver advice that consistently leads to good quality outcomes. And we must manage any risk that may arise in situations where our advice is brought into question or dispute. The development of our building construction professional report has come about as a result of our quality management system. A quality home modification is one which meets the participant’s needs, compliance requirements, and the criteria of the NDIA. The building construction report impacts on the quality of home modification service delivery quality across a number of areas. The process of Design Development at the assessment stage of home modification and beyond. Architecture & Access considers assessment to be the most important process impacting the quality of home modification, and for this reason, the home modification assessment process has become a major focus for our quality management. 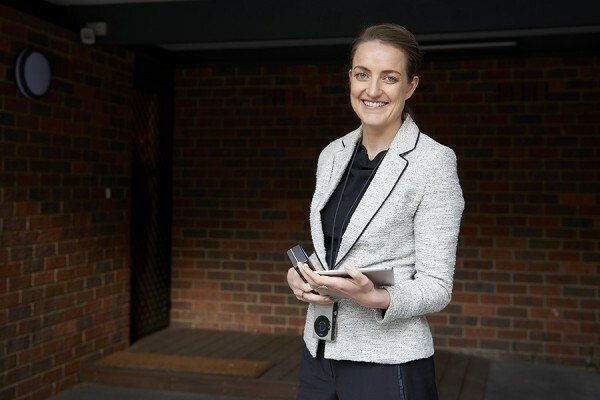 At the home modification assessment meeting, our specialist home modification building construction advice is central to the process of designing the home modification that meets client needs, regulatory and compliance requirements, and the criteria of the NDIS. The following case study illustrates how this work in practise. 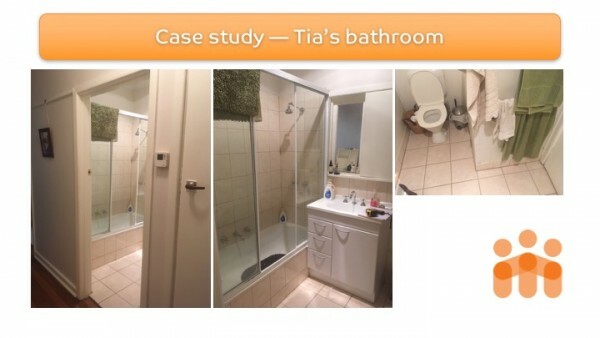 Tia’s family requested that their family bathroom to be modified to meet the needs of their child. Tia is young child who has autism along with some behavioural and coordination challenges. The parents were very keen to retain the bathtub because it used on occasionally needed by the child for relaxation. 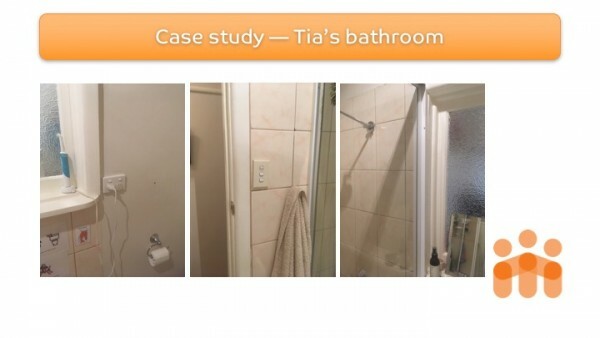 Figure 2: Site documentation of Tia’s bathroom pre-modification. 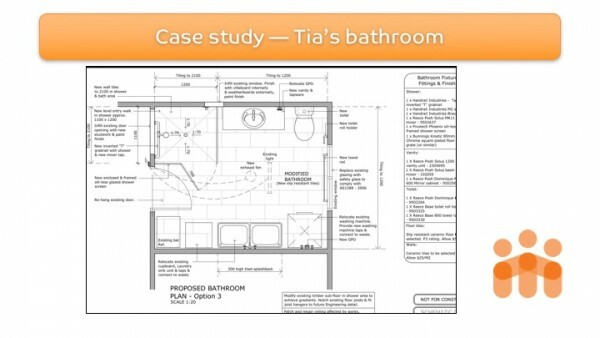 Figure 3: Site documentation of Tia’s bathroom pre-modification floorplan. The following are examples of site photos taken to identify the various site conditions which impact on design, construction and compliance. The occupational therapist and building construction professional discussed the functional requirements and other issues in relation to various design ideas. Below, are the initial alternatives discussed for the bathroom modification. Note: The concept plans are produced in a high level of detail here for the purpose of this presentation. Home Modification Victoria would not necessarily produce concept plans of this quality to present the client with design options at the assessment stage. The design on the left retains the bathtub as requested by the client, and the option on the right shows bathtub removal and creation of a larger and potentially safer accessible bathroom. Figure 6: Design options discussed with the client for the bathroom modification. Figure 6: Design options discussed with the client for the bathroom modification considering client needs and compliance requirements. The design on the left retains the bathtub as requested by the client, and the option on the right shows bathtub removal and creation of a larger and potentially safer accessible bathroom. Returning to Figure 3, the floorplan of bathroom pre-modification, it may be noted that many people, professionals included, may review this space and believe that they see a ready solution in moving the shower to space currently occupied by the linen cupboard. In fact, that was the solution initially thought of by the client. However, there were a number of construction and compliance issues related to air circulation, waterproofing and plumbing which precluded this approach. Home Modification Victoria proposed a superior third option which met the approval of the client, the OT requirements for independence, safety and care provision, and which satisfied the NDIS criteria for reasonable and necessary, viable and most cost-effective of available options. 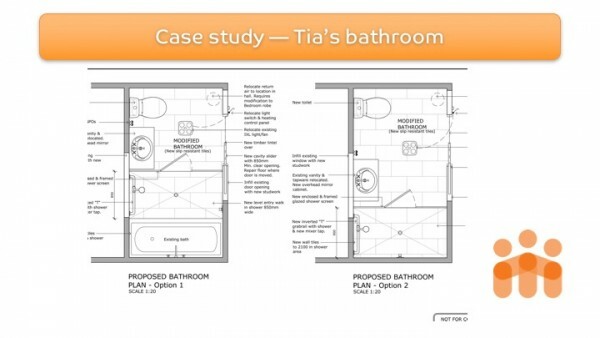 Figure 7: Preferred option for Tia’s bathroom modification utilises the laundry area and leaving the current family bathroom intact. Many less experienced OTs or builders may not have identified this option, assumed it to be more expensive, or deferred to the client expectations which may be already in place to modify the family bathroom. 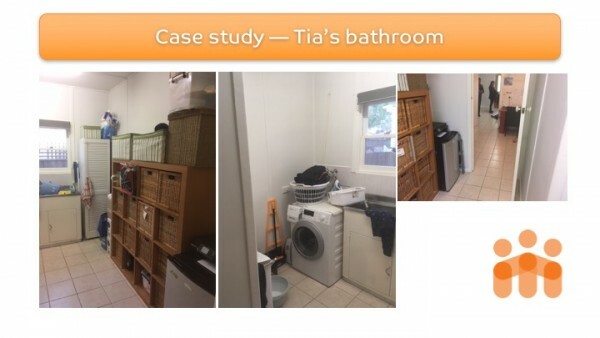 However, in this instance, Home Modification Victoria identified the potential of the laundry space for modification, and conceptualised a design that was superior in meeting the current and future needs of the participant in terms of function, safety and facilitating the work of carers. Our experience in cost estimation meant that we were confident that the cost of delivering this superior solution would actually be comparable to modifying the smaller existing family bathroom. Other cost-saving benefits were also identified in maintaining the family’s access to their original bathroom for the duration of the construction of the new one. The following images show the laundry area, the site for the proposed home modification. Figure 8: The laundry presented the most ideal location for the creation of an accessible bathroom. Here, the Home Modification Victoria building construction professional has demonstrated what it actually means to provide advice that the proposed home modification is the most suitable of alternative options. The impact of alternatives design solutions on functional outcomes. Criteria of the NDIS including assessment and recommendations of reasonable and necessary home modifications. 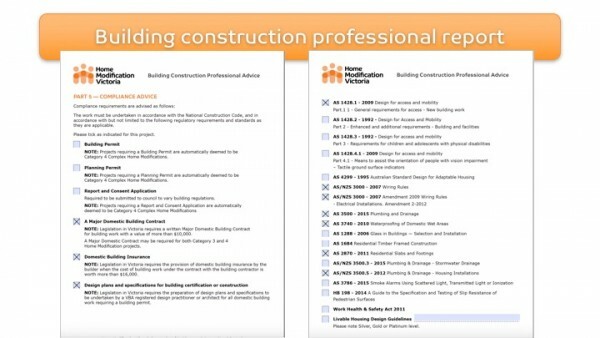 High-level knowledge of the national construction code and Australia standards that apply to residential construction, particularly in relation to building certification, plumbing, waterproofing, electrical safety, glazing, etc. Skill in home modification design, scoping and cost estimation. Our design and construction professionals develop into this role through obtaining formal qualifications and registration, induction training, and professional development which includes formal and informal training, mentorship and broad experience gained on the job. Minimum five years of experience in a construction project management role, including taking responsibility for the preparation of home modification project plans and cost estimations of home modifications for people with disability. Home Modification Victoria’s building construction professional report is completed and attached to the NDIS Complex Home Modification assessment Report. Recommendation for home modification – in this case a Bathroom Modification which as Non-structural, but complex due to waterproofing, electrical safety and other compliance requirements. Compliance advice which lists all the laws and standards that may be called up by the proposed modification, including that long list I put up before. A description of the discussion around client-funded components and how this will be managed. An all-inclusive cost of home modification is crucial so participants are not left underfunded (or overfunded), which may lead to significant delays in project delivery waiting for plans reviews etc, or unacceptable compromise on quality at the construction stage. 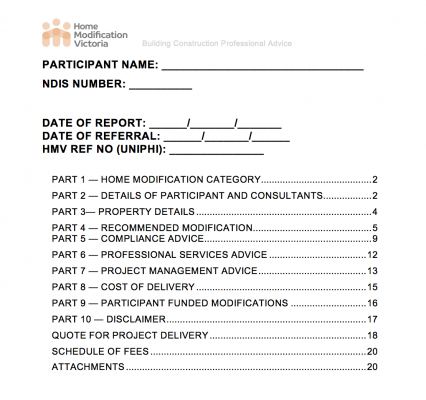 The perils of signing off Part 6 of the NDIS Complex Home Modification Assessment Report may arise for building construction professionals themselves, NDIS participants, and the NDIS as a whole. For the building construction professional, the perils relate to taking responsibility for the identification of compliance and other requirements of the proposed home modification design. While it would be unlikely to find a building construction professional who sets out to deliberately mislead or provide a substandard advice, it is clear that there are certain complexities associated with designing home modifications for people with disability that can only be fully understood and considered by experienced people. If building design and construction advice is poor, so will be the quality of the home modification and the functional outcome for the participant. General breakdown in team relationships and industry dysfunction in the home modification sector. Design and building construction professional advice is an essential part of the home modification assessment process. However, in signing off on Part 6 of the NDIS Complex Home Modification Assessment Report, or engaging a professional to do so, be aware that there is a lot more to Part 6 than meets the eye. The sign-off of Part 6 underpins the design, pre-construction and planning practices needed for the successful delivery of quality home modifications. The Building Construction Professional Report fits in to Home Modification Victoria’s quality management system, which we have put in place to ensure that our services meet the needs of the participant, regulatory requirements and the criteria of the NDIS. A key reference and enabler of collaboration between the team, particularly the assessing OT, the building and design practitioners. Provides an independent record and reference for the OT, the participant, the NDIS planner and technical advisory team. Total cost of project delivery including design documentation, costs associated with specialist consulting from professional such as engineers, planning and certification costs, project management and construction. The planning practice that identifies project milestones and checkpoints to ensure the project is delivered as designed. Specification of fittings and fixtures. 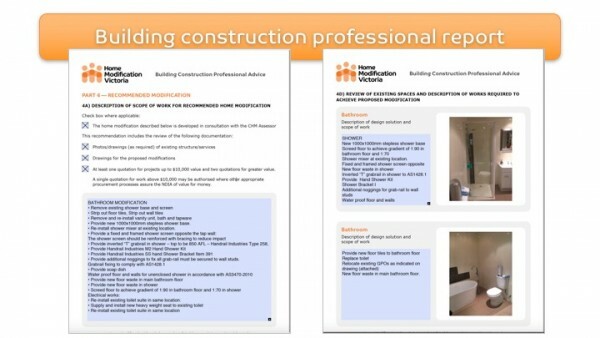 The provision of building construction professional advice must occur in the context of a wider quality assurance system which assures the NDIA and the participant that the building construction advice will consistently result in quality home modifications that meet participant needs and deliver intended outcomes. The paper is reproduced as presented at the 2017 MODA Conference in a format suitable for online publication. The information provided does not constitute and may not be relied upon as professional advice. Home Modification Victoria is a service of Architecture and Access. We provide an integrated in-home assessment by qualified and experienced occupational therapists and building construction professionals for NDIS participants who have home modification as a goal in their NDIS Plan. We also work with private OT practitioners who are registered and meet the NDIS criteria to provide complex home modification assessment. Architecture and Access services cover home modification assessment, design and delivery. We have more than 30 years experience completing more than 500 major home modification projects for the National Disability Insurance Scheme, Transport Accident Commission, WorkSafe and private clients. Please contact Home Modification Victoria at Architecture & Access with any questions or requests for information related to the content of this paper. Download Home Modification Step-by-step Guide for NDIS participants.